Spirit Mountain Community Fund selected The Shadow Project’s Alejandra Gurrola from its 11-county service area for the “Ye? Ian Lima” (Helping Hand) Award, for her dedication to children in special education. Spirit Mountain Community Fund’s goal is to improve the quality of life in Northwest Oregon through community investments that provide lasting benefits consistent with the Tribe’s culture and values. The Helping Hand award is given annually to a non-manager staff member of a nonprofit organization, who motivates others, demonstrates dedication to mission, and/or inspires others to excel. 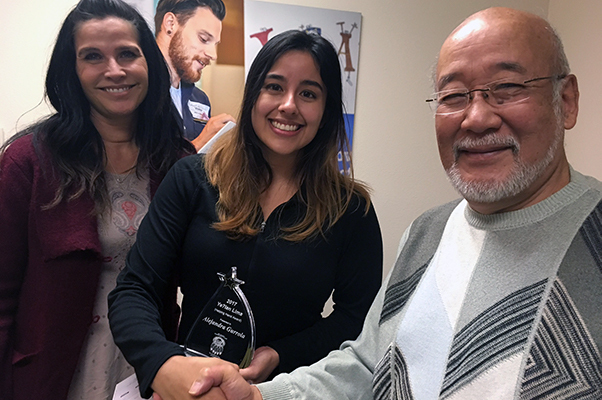 The Shadow office received a surprise visit in late December by Spirit Mountain Community Fund board chairman Sho Dozono, Executive Director Mychal Cherry, and Program Coordinator Angela Sears, presenting Shadow’s Program/Volunteer Coordinator with her award. Added Christy: “Alejandra helps students set and meet reading goals, reaches out to parents in their native language, and invites them to celebrate their children’s reading success.